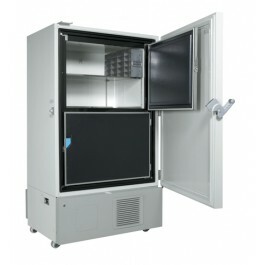 The Glacier 9668 Upright 23.5 ft3 (668 L) Capacity Ultra Low Temperature Laboratory Freezer creates optimal storage conditions for the preservation of your research through reliable long lasting control systems. Energy efficient cascade cooling system monitors temperature and pressures throughout high and low stage circuits. The Inner chamber is surrounded by foam-in-place polyurethane insulation from all sides. Two (2) insulated inner doors maintain interior temperature during openings. Multiple point gasket seals lock in cool temperatures while keeping out ambient air. A heated bypass coil around the inner doors reducing frost build up making it easier to access your samples. Consistent temperature uniformity throughout the chamber increases your cell viability. Microprocessor controls operate cooling functions creating optimal storage conditions while minimizing energy consumption. By using the refrigeration system to help cool the oil that runs the compressors, they are able to run longer and provide greater temperature uniformity increasing reliability. Glacier freezers are RoHS compliant, utilize CFC-free refrigerants and insulation eliminating ozone depletion while efficient compressors minimize energy consumption reducing our carbon footprint. Eye level controls, claw-like door latches, low force door opening, and exceptionally quiet 47 dBa operation create a friendly working environment. Microprocessor controls are simple to use monitoring and controlling temperature and alarm set points. Visual and audible alarms for high and low temperature, power failure, sensor failure, battery life, fan motor life, filter check, and door ajar. Weight 783 lbs. / 355 kg. Remote Contacts N.O. and N.C. Please note specifications are subject to change. Please contact NuAire to verify before purchase.